Let me begin by saying that two weeks ago I’d never heard of “clafoutis.” I didn’t know how to pronounce “clafoutis.” I certainly did not foresee myself making “clafoutis,” and then eating it three separate times in the same day. I wanted to tell you the proper way to pronounce clafoutis, so like any red-blooded American I went to Wikipedia. Reading through the clafoutis article just now, I’ve realized that this dish can only be called a clafoutis if it is made with cherries. When made with other fruits, it is referred to as a “flaugnarde” which is really even more ridiculous than clafoutis and I can’t quite handle that. Let’s just continue to refer to it as a clafoutis, simply because this whole mess is getting too French for me. So back to the pronunciation thing: since I also don’t know how to read phonetic symbols (although I did attend approximately 28% of the scheduled classes for my phonetics lecture at university), I’m going to guess that it is pronounced like “kla-foo-tee” with extra emphasis on the “tee.” Please correct me if I’m wrong! Right, so whether you are making a clafoutis with cherries or a flaugnarde with peaches, the method is the same. You’re essentially mixing fresh fruit with a delicious flan-like custard and baking it in the oven. It’s heaven, really. My incredible friend Michele came over the morning I was baking this and we weren’t sure if it was meant to be a breakfast or a dessert. So we ate it for breakfast. And then later I ate it for dessert. And maybe in between those two events I snacked on it midday. 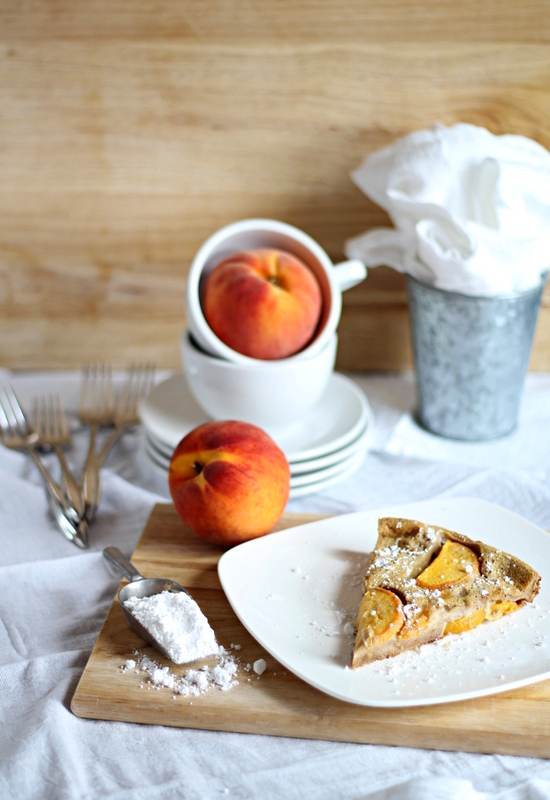 My kitchen was overflowing with an abundance of ripe, delicious peaches so I wanted to make something that really showcased their sweet flavor. This (faux) clafoutis did the job perfectly. I decided to mix things up a bit and spice the clafoutis with chai spices to complement the fruit. Rather than using a traditional pie dish, I decided to bake the clafoutis in a cast iron skillet. I don’t know why but I just love making desserts in that thing! It makes everything seem so rustic and lovely. I adapted Julia Child’s original clafoutis recipe because it seemed like a perfectly good place to start. I just finished reading Julie & Julia (I must be the last food blogger on the planet to read it! ), so Julia Child has been on my mind lately. Since I also recently bashed French food as being unnecessarily complicated, I thought that you might appreciate a simple and delicious addition to your European repertoire. Bring a large pot of water to a boil over high heat. Set out a large bowl of ice water. Use a sharp knife to score the bottom of the peaches with a large “x”, then place them in the boiling water for 30 seconds. Remove, and plunge immediately into the ice bath. Let sit for another 30 seconds, then place on a cutting board to rest for a few minutes. Starting at the bottom of the peach, use your fingers to peel back the skin by tugging on the corners of the pre-scored “x.” Once peeled, discard the skins and thinly slice the peaches. Place the cinnamon, ginger, cardamom, cloves, and coriander into a large blender. Add 1/3 c. sugar, eggs, vanilla, salt, flour, and milk and blend until smooth. 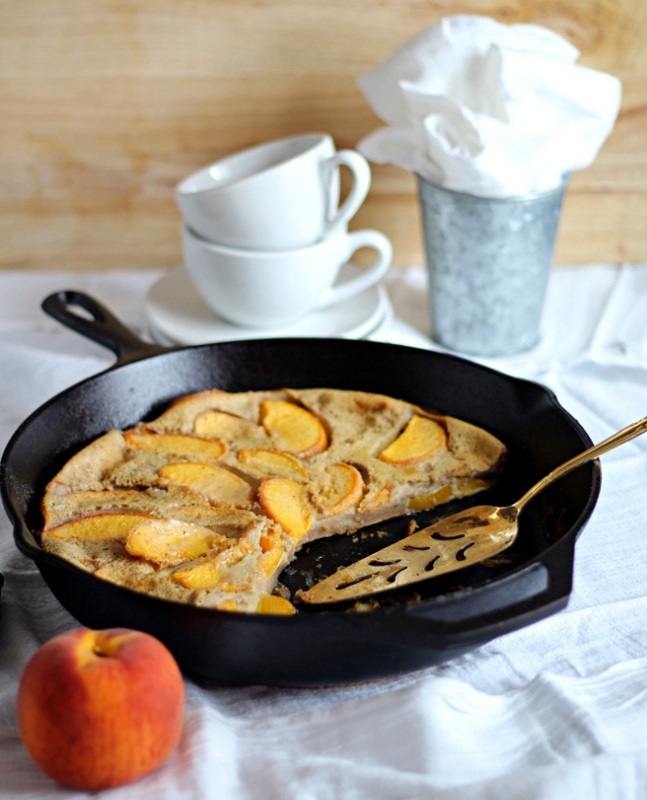 Grease a 9-10″ cast iron skillet with butter and pour in a 1/4 inch layer of the batter. Bake for about 2-3 minutes or until a film of batter just barely sets in the pan. The rest of the batter will still be raw. Remove from the heat and keep the oven on. 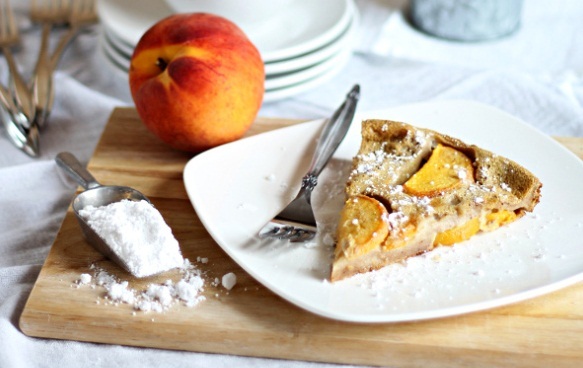 Lay the sliced peaches over the batter in a circular design. 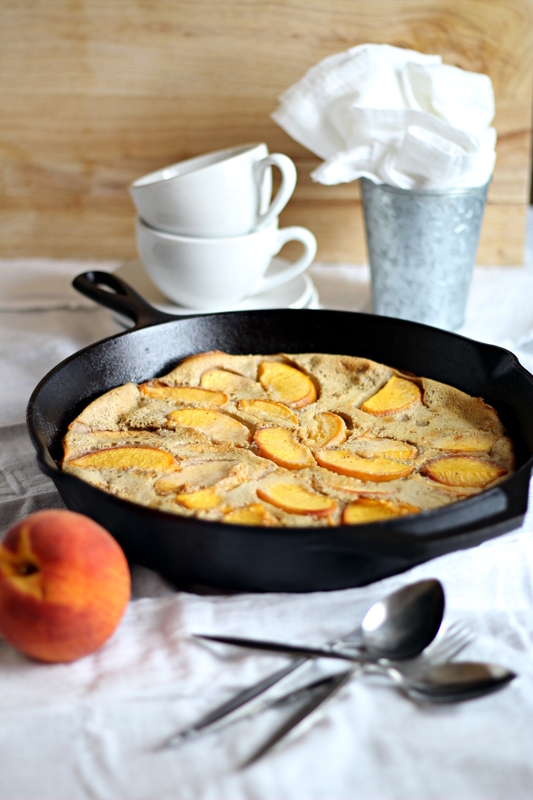 Sprinkle the remaining 1/3 cup of sugar over the peaches, then pour on the rest of the batter. Bake for another 45 minutes to 1 hour. Remove from the oven when it is puffed and brown, and a knife comes out clean. Sprinkle with powdered sugar, serve warm.